Three reasons why being a part of theCalypso St. Barth Generations of Style campaign was such an exciting moment for me. 1- I am obsessed with Calypso, even more so since moving to a beach town and having to completely overhaul my summer wardrobe to suit the demands of a festive social life in Westport, CT. And I mean come on, look at the amazing Mommy-and-Me styles, how could you not want to wear any one of the four styles as often as possible? 2- The fact that I don't have many (or maybe any!) 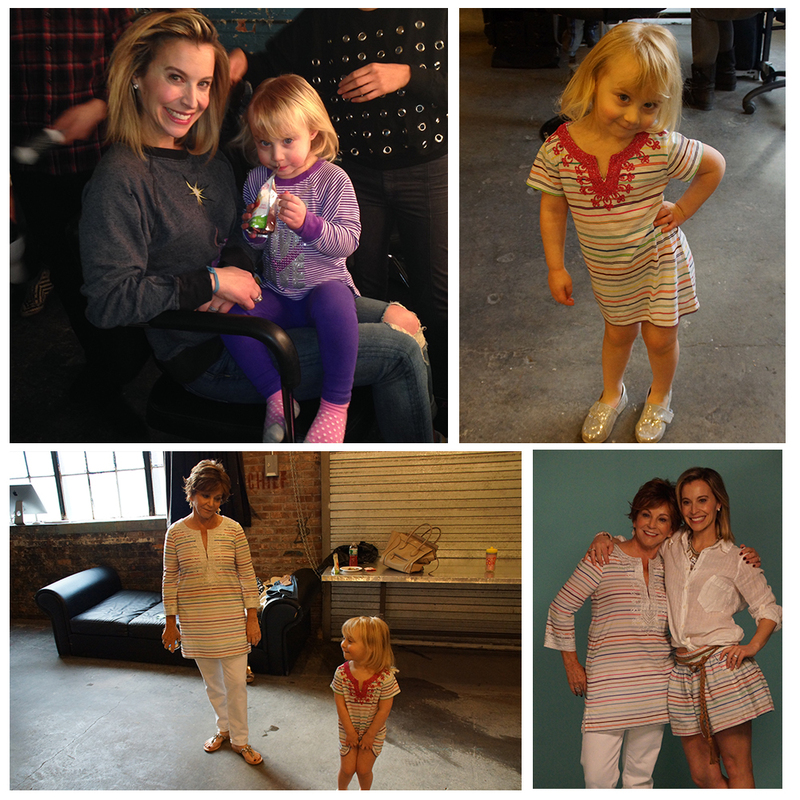 great photos of my mom, my daughter and I is a constant source of personal stress. I have always been paralyzed with fear at the prospect of bringing Alexa into the city for work-related stuff. Many times I have been asked to tote her to events, use her as a model in segments, etc. And every time my answer has been the same- unless you have an IV filled with Xanax, there is no way I can do it, but thanks for asking. So I coerced my mom into coming up to visit and accompanying us to the shoot. She could help me watch Lex and in turn, I would have less of a chance of sweating through the lovely clothes seconds after stepping on set. Early one morning, we piled into a car and made our way to Industria studios, armed with 2 fully charged iPads, and a prayer for no traffic or tantrums. When we arrived, and the Calypso team noticed that the "babysitter" was actually my mom, they invited her to be part of the shoot- unexpected and very exciting. Especially since she was having a good hair day. Lex sat on my lap while I got hair and makeup done, sipping away at apple juice, skeptically looking around, not quite sure what was going on around her. I held my breath as the set stylist showed Alexa her outfit, and when she smiled excitedly, I resisted the urge to scream out "MIKEY LIKES IT!" Once warmed up, Alexa was quite the on-camera ham (she is my daughter, so I guess what did I expect?). There was a little posing practice, a lot of half-eaten muffins, and one truly amazing morning. This whole experience reminds me why I keep on doing what I do. As I have written before, so much of my motivation to keep building my career is to give Alexa exposure to the incredible experiences that I am privy to as a result of it. The wonderful and talented people that I get to spend time with, and learn from- creative directors, marketing executives, stylists, producers, publicists, makeup artists, and so on. This is one of what I hope will be many opportunities to show Alexa how fun and rewarding work can be, and to remind her when she is feeling un-enthused by her current situation- be it a course in school, a role in a class play, a position on a sports team, or a job in the "real world"- it is completely in her power to change it and make it what she wants it to be.